NEXT | The Queue: Nobody sing Under The Sea, okay? Get your steins and rams ready, Brewfest has begun! Scheduled this year from September 20 to October 6, you have a full two weeks to get your ram racing, beer drinking, and mount farming in. We have an, ah, interesting addition to the Brewfest vendor this year. Now, I’m not sure why anyone would want to wear a hat made of sausages, but I know you toy collectors wont be able to pass anything up. It’s available for 100 tokens, which you can earn via Brewfest dailies and games. 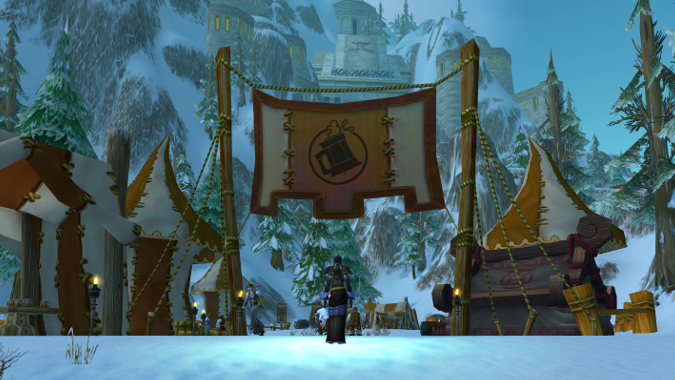 If you want to maximize your token collecting, Wowhead has a great guide all about Brewfest. Coren Direbrew‘s loot has been updated for Legion, offering us 810 item level trinkets while we try in vain for the ever elusive Brewfest ram and kodo. You can queue up repeatedly for the dungeon for unlimited attempts at trinkets, but the Keg-Shaped Treasure Chest, which can drop the mounts and other goodies, is only available from your first Coren kill of the day. If this year’s holiday follows those of the past, you’ll likely only be able to queue for Coren if you are level 110. Vendors also have two new items. Spirit Spirits will apply a spooky debuff when you drink it, and you can now throw sausages at your friends with Throwing Sausage. This is bound to make today’s new raid more interesting. If you’re still making your way through the Broken Isles, make sure to pick up the Brewfest buff from your faction’s respective Brewfest areas at 6:15 PDT every morning and evening. In the past, Mekkatorque and Vol’jin would come out and make grand speeches, applying the 2 hour buff to everyone in the area. We’ll have to see who Orgrimmar’s head of festivities is this year.